The only reason I have this for stars instead of 5 is because it's too easy giving any Karin Bishop work 5 stars. Her work is so consistently good, it's easy to fall into the everything is excellent trap. I think I need to start grading on a 'Bishop curve' where a 2 would be 6 stars grading nearly any other author's work. 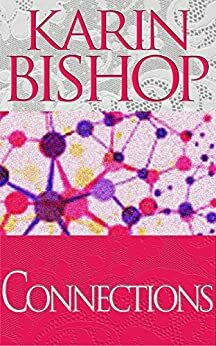 This is Bishop at her stride... characters that draw you in and situations that compel you to keep reading, even if you find yourself putting off other obligations. Her worlds are so engrossing, it's easy to get lost in them. I only give this 4 of 5 stars because she has written even more amazing stories, like the On The Road series, Fool Moon, Fashion Club, A Necessary Fiction and others. When everything is 'excellent' the superlative is diminished. I'm now grading her work on a special 'Bishop scale' where 2 stars would be 6 for nearly anyone else. Every Bishop work I've read has been great. Some have been staggeringly brilliant. CONNECTIONS is great. I recommend it without hesitation to anyone who likes Bishop ... or has read the sample and reviews and thinks they might. Sure, it is similar in spirit to Salvations, but I see that as a plus. I enjoy hush puppies AND corn fritters, I like both Happy Together AND Elsinore by the Turtles. One can enjoy - and recommend BOTH Salvations and Connections. I had fun with this book. I laughed and cried. I had some self realizations. Things that needed to be dealt with. So many of Ms. Bishop’s books have uncovered things I needed to process. I hope her writing will help others too. A great story, of the only a miracle variety, that's got several plot holes. Like this 18 year old Matt character getting all pervy with a 13 year old, who the books described as being as developed as a 10 year old girl. The totally inappropriateness of that took away so much. Yes the main character was a 'genius,' but still too young. 5.0 out of 5 starsAnother Classic! You honestly can't go wrong with a Karin Bishop story. While this story is similar to Salvations. This story is so different and wonderful that you are left wanting more at the end. As usual the interaction between the character's is the biggest draw to the story, And the twists and turns leave you turning page after page before you realize you are at the end. What can one say about Karin Bishop all her work is brilliant it is too easy to slip into the trap of giving her 5 stars. the only reason I have not done it here is because some of her other stories I consider far better like Fool Moon, Fashion Class & Breath of Life.